Shannon Quinn is a dancer and teacher at Dance Place, a nonprofit arts campus in Washington, D.C. In April, her company, ReVision dance company will perform “Just Be” in honor of her father; the late Timothy J. Quinn. The April 27 performance includes a VIP reception with proceeds benefiting The Arc. Tim Quinn was Executive Director of The Arc of the Northern Chesapeake Region from 1990 to 2010. Tim was a visionary leader and advocate for people with disabilities, respected nationwide for his efforts. During his time with The Arc, his chapter was recognized for the quality of its services and commitment to personal empowerment and inclusion. And, Tim personally received the National Conference of Executives of The Arc 2009 Executive Excellence Award. Growing up with my father, Tim Quinn, I was inspired from an early age to work with individuals with intellectual and developmental disabilities. I would travel every summer with my dad to The Arc conventions, and tag along when I could in his office at The Arc Northern Chesapeake Region. I was inspired by his kind heart and genuine interest in every person he came into contact with. Teaching has always been a passion of mine, and since my father’s passing, I became more involved in teaching dance to children and adults with I/DD. I walk away from each class uplifted and focused on how individuals no matter what their abilities are, can be impacted by dance. As my work with individuals with I/DD increased over the past two years, I had some serious thoughts about inclusion and how the word inclusion shouldn’t really even exist. Every human being has the right to live a fulfilled engaging life, no matter what their ability, and that should be a given. As an artist, I began to form these thoughts into movements and from there, the piece “Just Be” was born. In the work, I explore subjects like support and “people first language.” What does it mean to support individuals with I/DD and then in return, how does that support translate into those individuals supporting themselves? 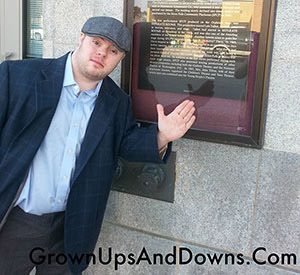 The piece also focuses on people first, rather than labeling by an individual’s disability. I want my message to be positive and uplifting to every individual. Dance is universal and has no limits. This project has reinforced my belief the dance can bring people together, no matter their age, background, ability, experience, profession or skill level. On Saturday, April 27, the ReVision dance company will perform “Just Be” and host a VIP reception organized in partnership with The Arc of the United States with a portion of the proceeds benefiting The Arc. The performance features children with disabilities from the Mamie D. Lee School who were taught by instructors from ReVision dance company. Also, the performance includes students from The Arc of the Northern Chesapeake Region shown on film. I hope you’ll be able to join us at Dance Place and help celebrate my father’s legacy to celebrate and love ALL people. Find out more about our dance company and this performance at www.danceplace.org. Twenty-six years ago we successfully advocated for March to be declared National Developmental Disabilities Awareness Month. And, there is no doubt that we have made tremendous strides to promote and protect the rights of people with I/DD to live, learn, work and play as valued and contributing members of their communities, the real strength of our message comes straight from the individuals we serve. No matter how effective our organization’s advocacy efforts may be, no one is as powerful an advocate for people with I/DD as a person with I/DD. So, this year during March, The Arc would like to empower all individuals with I/DD to appoint themselves as their own advocates. As a self-advocate, you can help take the movement for people with I/DD to others in your community. It can start with a simple question. This March, ask everyone you meet: “Did you know that March is Developmental Disabilities Awareness Month?” That may spark a conversation – a teachable moment – when you can share your experience living with a disability with someone else. Find a local chapter of The Arc and get involved. Or donate to or join The Arc at the national level. Help us raise awareness about what’s important to the I/DD community and why. Read these suggestions for getting the word out and get more information about I/DD at www.thearc.org. Sign up for The Arc’s Action Alerts to keep your finger on the pulse of the movement for I/DD. Follow the conversation on Facebook (facebook.com/thearcus), Twitter (@thearcus) and here on our blog and be sure to chime in when you have something to say using the hashtag #DDAware.